Cardiff-based Irish poet Ailbhe Darcy's second collection Insistence was written in the American Rust Belt, in an era of climate change and upheaval. Insistence takes stock of the parent’s responsibility to her child, the poet’s responsibility to the reader, and the vulnerability of the person in the face of global crisis. Insistence was published by Bloodaxe in May 2018, and was shortlisted for both the T S Eliot Prize 2018 and the Irish Times Poetry Now Award 2019. It is shortlisted for the Pigott Poetry Prize 2019, the winner of which will be announced at Listowel Writers' Week on 29 May 2019. Ailbhe Darcy will be reading from Insistence alongside Vahni Capildeo. Book tickets via the festival website at ilfdublin.com/events. Ailbhe gave a series of launch readings for Insistence, starting in Cardiff, with further launches in Dublin and Cork. She read at Ledbury Poetry Festival in June 2018, at the John Hewitt Summer School in Armagh in July, and in Newcastle in October (a film of her wonderful reading in Newcastle is posted below), as well as at the T S Eliot Prize Readings at London's Royal Festival Hall on 13 January 2019. She read at the Cúirt International Festival of Literature in April 2019. The full T S Eliot Prize Readings are available here. Ailbhe Darcy read exclusively from her long poem 'alphabet'. Links to radio interviews with Ailbhe Darcy are here. An in-depth review is on the international online journal BODY here. Click here to read the full review in Dublin Review of Books. This video is an excerpt from the fuller video below and shows Ailbhe Darcy reading her poem ‘Nice’ from Insistence. 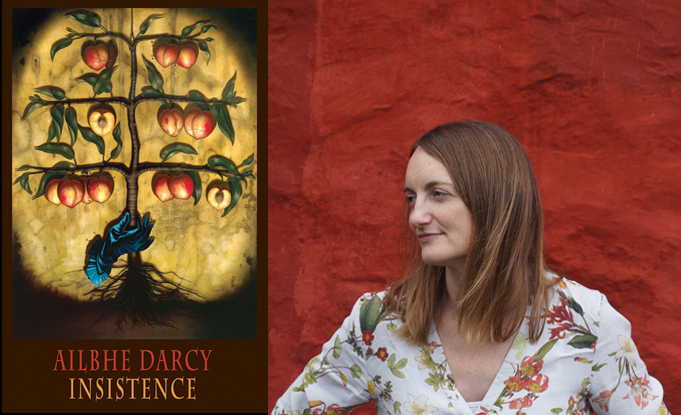 In this excerpt from Ailbhe Darcy’s reading (with Finuala Dowling) at Newcastle Centre for the Literary Arts on 11 October 2018, she reads six poems from Insistence: ‘Nice’, ‘After my son was born’, ‘A guided tour of the house and its environs’, ‘Ansel Adams’ Aspens’, ‘Silver’ and ’Still’.